There shouldn't be a trade-off between doing well in school and good health. Even among children from the most disadvantaged upbringings, there are shining stars -- kids who, despite the odds stacked against them, overcome and make it. Psychologists describe these upwardly mobile kids as "resilient." But recent research from Northwestern University and the University of Georgia shows that resiliency might come at cost. 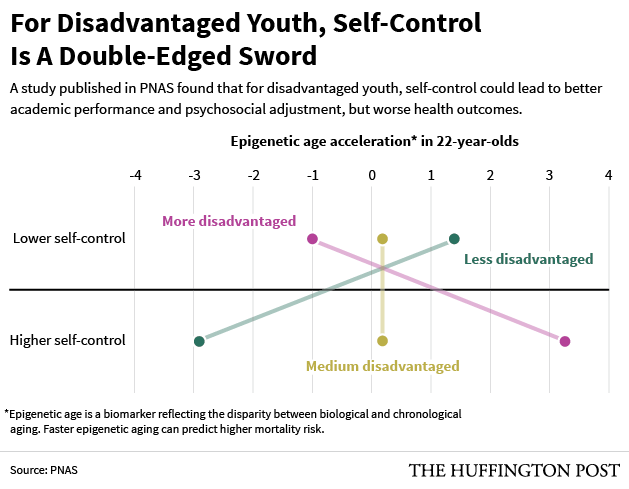 Measuring DNA methylation, researchers found that in disadvantaged communities, the cells of children who exhibited more self-control (and became more successful) visibly aged faster than the cells of children who maintained the status quo. In short, the most upwardly mobile kids were the most physically unhealthy. "We call this phenomenon 'skin-deep resilience,'" said Gregory Miller, a psychology professor at Northwestern and the lead author on the study. "On the surface, they’re resilient, right? They are doing well in school. Their mental health is good. They have no trouble with the law, no trouble with substance abuse." "But when you 'unzip' them and look inside at health, they look surprisingly worse than you’d expect," he added. The study, which was published in Proceedings of the National Academy of Sciences in July, followed 496 black teenagers from working-poor families in rural Georgia, and comes on the heels of two other papers examining the outcomes of these same families. Equally troubling, but less surprising, is that the findings only hold true for low-income, disadvantaged teenagers. Individuals from advantaged backgrounds who exhibit resilience and go on to great achievement generally have better health than their highly advantaged, but less-successful peers. Miller echoed this sentiment. "If you’re a low-income, African-American teenager from a rural town, the odds are stacked against you," he said. "It’s highly likely that you attend a school that’s under-resourced, in a community that’s under-resourced. So, to succeed and excel academically, you have to work harder than the affluent suburban kid does." The advantage gap doesn't get ironed out at college -- in fact, it may seem even more stark. Kids from disadvantaged communities consistently find themselves less prepared than classmates who attended stronger schools with more resources. They may also find that they don't look like their classmates, and can't identify with them. As the New York Times reported in April, there is a growing effort to study the experiences of high-achieving disadvantaged kids. Anthony Abraham Jack, a sociology Ph.D. candidate at Harvard, breaks first generation college students into two groups: the "privileged poor" and the "doubly disadvantaged." While the privileged poor attend private high school and are ready for the culture shock of a monied college campus, the doubly disadvantaged go to distressed high schools. These students often feel blindsided by the wealth of their new classmates, who breezily recount European vacations and describe “going to Martha’s Vineyard or the Hamptons because that’s where someone’s graduation party was,” Jack told the Times. "If you’re one of the kids in our study, you may show up to college and find that you’re very different than most of your peers, and that fitting in, finding a social network, and finding friends who can help you cope with the inevitable challenges and frustrations of college isn’t an easy task," Miller said. Discrimination is another likely piece of the puzzle. Many of the Northwestern-Georgia study subjects reported feeling alienated on their college campuses, including some brush-ups with outright discrimination. In response to these social challenges, the "strivers," as the researchers called them, doubled down on their resolve to succeed academically. "They just pour themselves into their studies in this very intense way," Miller said. Naturally, this single-minded focus on academics takes a toll over time. The kids, whose families and communities invested so much in their success, feel obligated to continue to climb the socioeconomic ladder, and sometimes neglect key components of health, like physical activity and good diet, in the process. "They feel this tremendous sense of obligation to do well and give back," Miller said. "That’s a lot of pressure for anybody to handle." While institutions have tried to diversify their study bodies in recent years, administrators could do more to help first-generation college students succeed in the health-and-wellness arena and to manage stress more effectively. "The focus has become so much about getting the most prestigious degree and the highest paying job," Miller said. "We’ve lost sight of universities and colleges being a place where we cultivate people who are good, informed, balanced citizens and people." So for now, kids from challenging backgrounds are caught in a catch-22. "Do you do well in school... or do you have good physical health?" Miller asked. "People shouldn’t have to be making a trade-off."